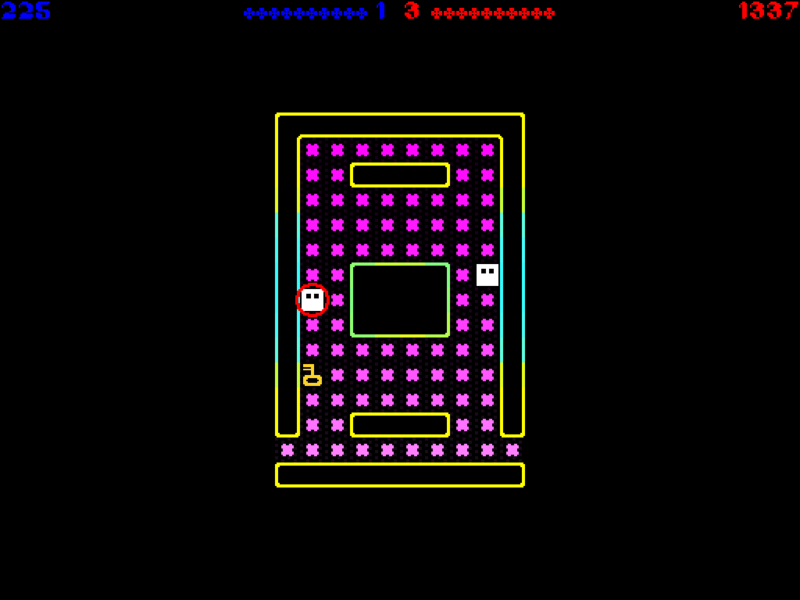 10 word description: Tiny arcade game; mazes + monsters + shooting; single or simultaneous 2-player. 10 word review: Pac-man meets Robotron at Rogue-like convention in Jeff Minter’s garden. Awesome! Use of colour is subtle - iPad screen image. 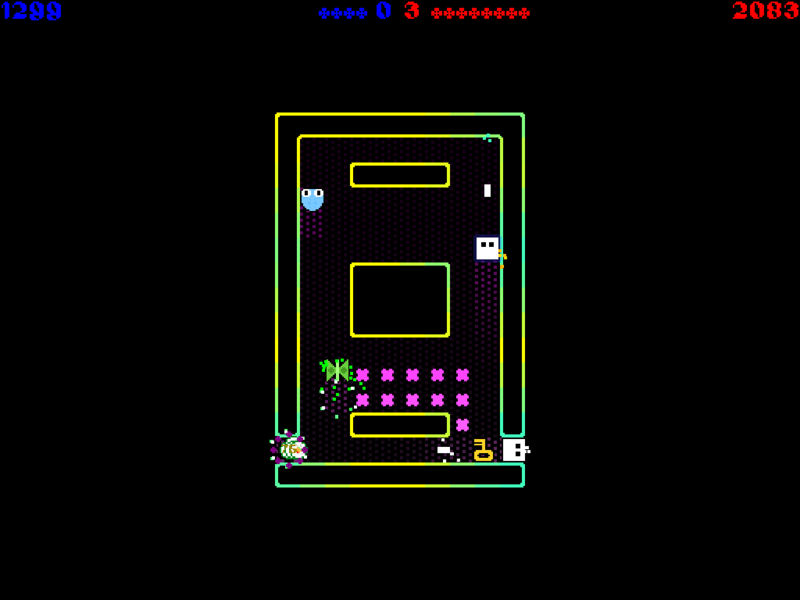 The good news: Forget-Me-Not takes some of the best elements of 80s arcade games, adds the infinite challenge of procedurally generated dungeon-style mazes, blends in some addictive high-scoring strategies and even includes a simultaneous 2-player option. And it has relative touch control, a personal favourite here at Arcadelife. You can play in portrait or landscape mode. Oh look, a centipede! The bad news: No in-game music. This doesn’t matter. The key doesn't just open the exit door, it protects you from your own shots in wrap-around corridors. 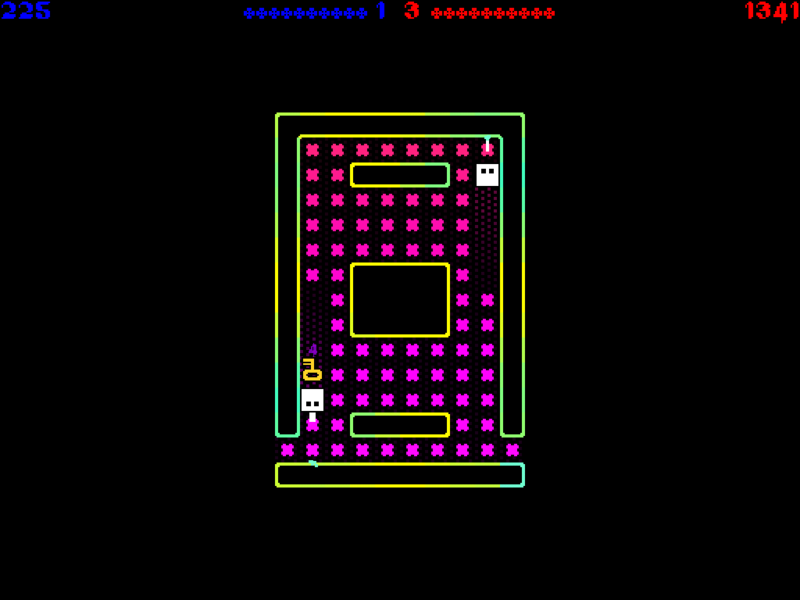 Arcadelife verdict: This game reminds me of all sorts of very early arcade games, not just Pac-Man, but if I start listing them here it will only serve to confuse the majority of today’s iOS gamers. For anyone who thinks it’s easy to create a good retro arcade game, it really isn’t. I’ve tried enough times, so I can fully appreciate the genius behind this one. As with all the best arcade games, you learn as you play and the more you play, the better you become and the higher you score. 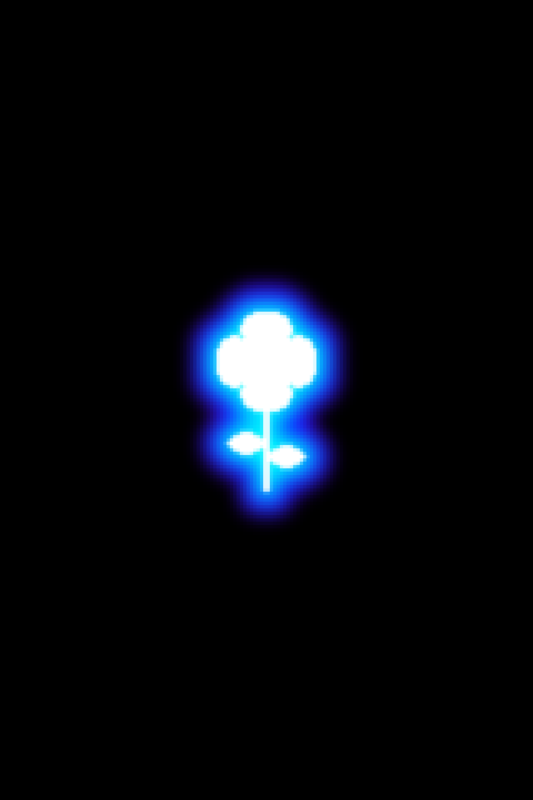 Recognising enemies and memorising their abilities and attacks is less than half of it; mastering wall-grinding and combining that with collecting as many flowers as possible in a sequence combo … that’s where your highest scores are going to come from. If you take too long to complete a level, this big evil ghost appears and starts chasing you. 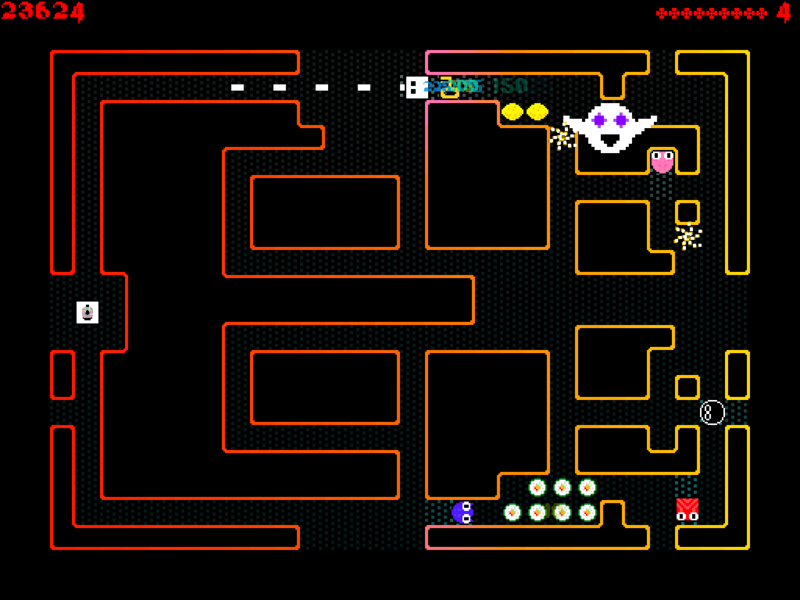 Ok, I was very hesitant about referencing Pac-Man because Pac-Man is slower and less interesting than Forget-Me-Not. However, the mazes and pill/flower collecting make the comparison mostly unavoidable. 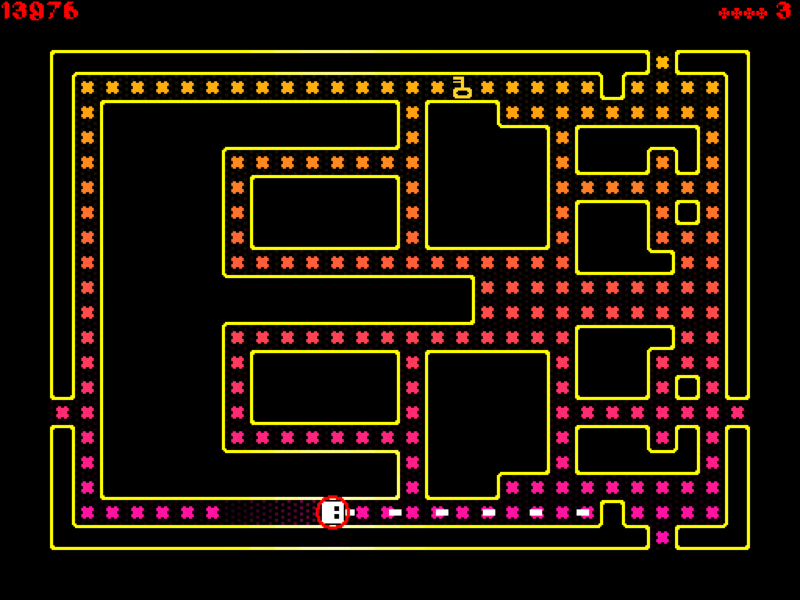 Please just don’t be put off this game because you don’t like Pac-Man. 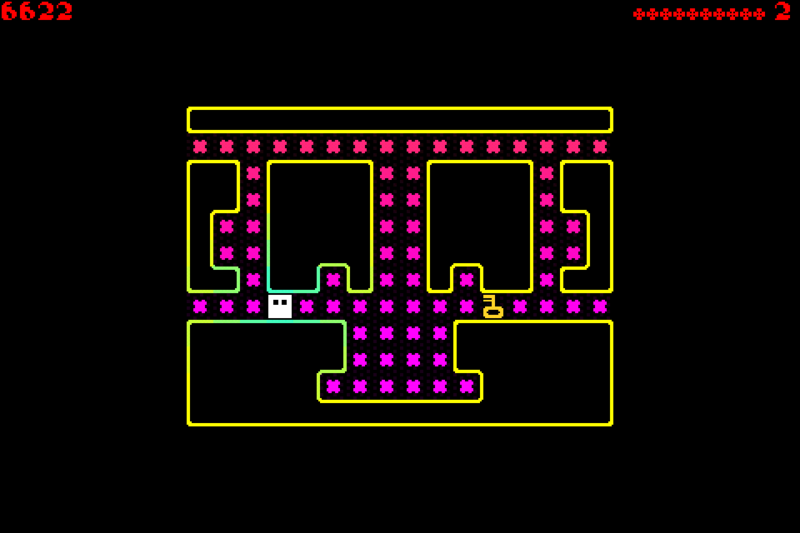 This game looks a bit like Pac-Man but plays much faster and with a lot more going on. Anyone interested in a new retro arcade game for their i-device(s) needs to get this. I tend to prefer playing it on the iPad, but that’s just a screen-size thing. Brilliant game, recommended. 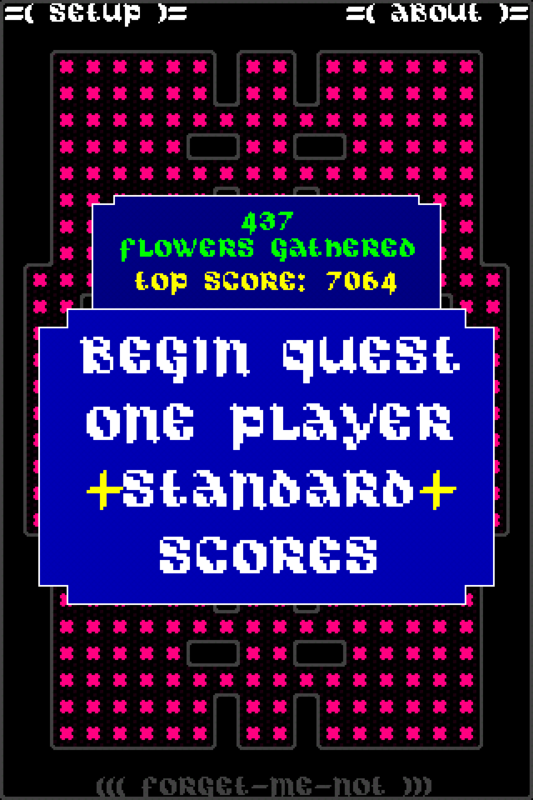 Click the thumbnails to view full screen – some images of 2-player Forget-Me-Not on iPad. 10 word description: Line-drawing puzzle game. Direct bouncing ball with lines. You have to deflect the bouncing ball towards the chequered flag. 10 word review: Gameplay falls slightly short of the promise of the graphics. The ball must not hit anything else on the way to the flag. 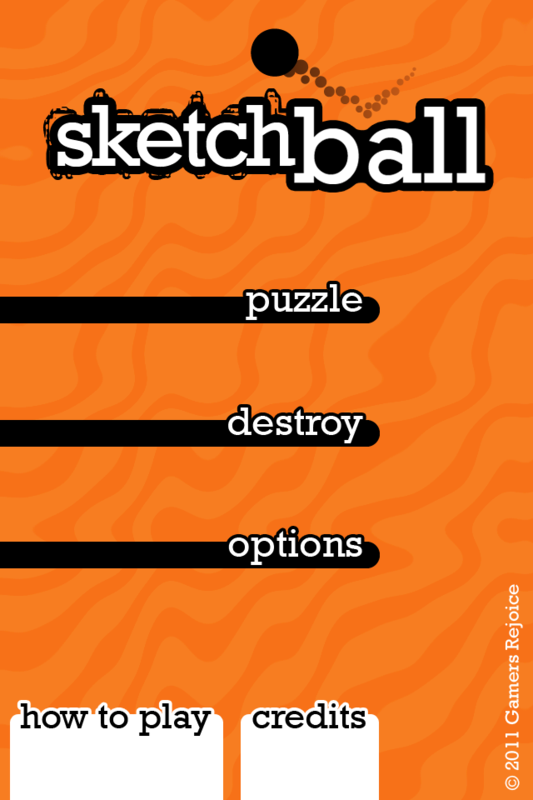 You will like this if you enjoy: Line drawing, ball-physics, puzzle games. The good news: The presentation and art style is attractive, clear and consistent. The concept is different enough to definitely warrant a look. 'Destroy' mode, aka - draw an umbrella around the target. The bad news: (It might just be my brain doesn’t work this way, but…) I found puzzle mode quite frustrating and resigned on level 8. I found destroy mode way too easy. 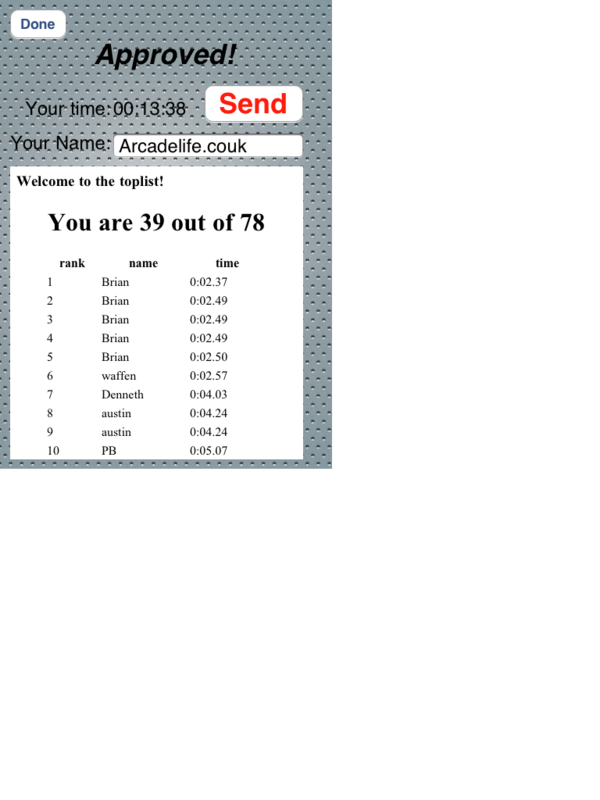 Arcadelife verdict: The problem I’ve got here is I can see how this game is meant to work, and I like the concept. I can also see that a lot of time and care has been put into the graphics and overall presentation. Even drawing the lines works well, they end up pretty much where you want them to be and there’s an erase function, etc. 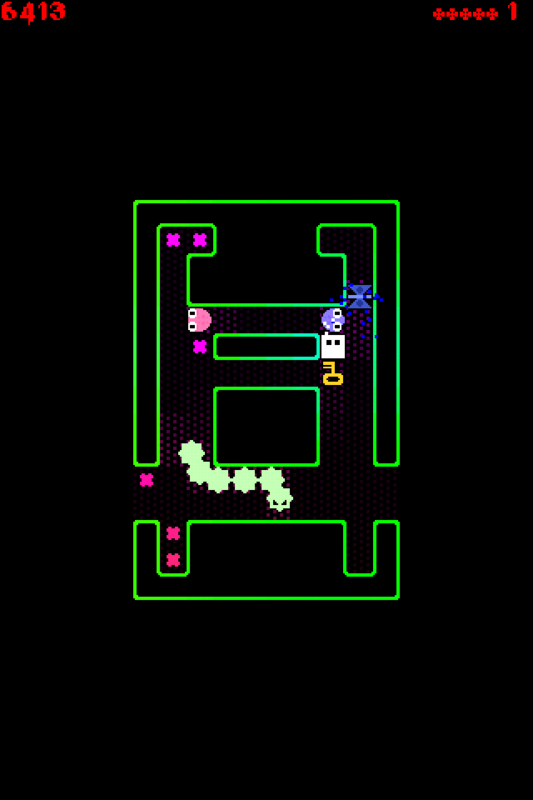 It’s just … I kept getting the ball stuck in a terminal ping-pong loop, or wedged behind an inadequately drawn line, or I just kept failing the same puzzle over and over because I’m rubbish at this game. 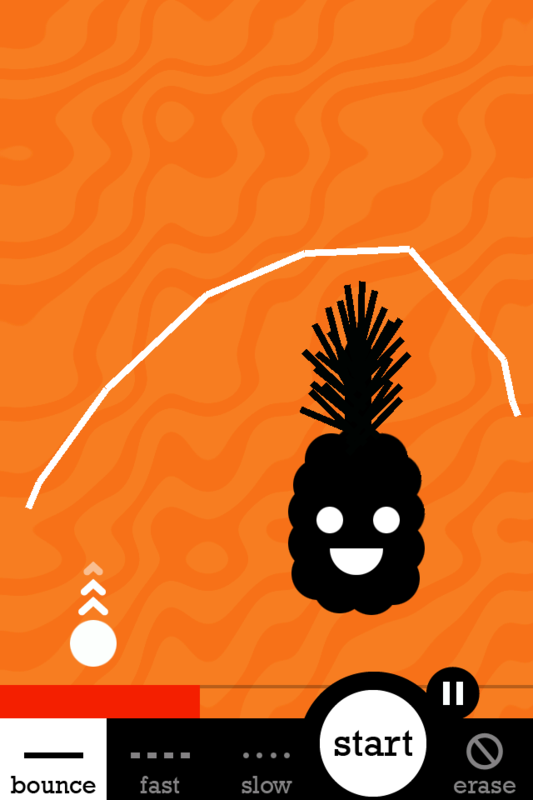 No smirking pineapple can withstand my badly drawn umbrella line attack! That was puzzle mode. So I gave up on that and tried ‘Destroy’ mode. Again, it’s a good idea but there’s one slight problem. If you draw a kind of umbrella line over the target, it gets destroyed very quickly. And you can do that same thing over and over again, at least up to level 10, at which point I stopped because I wasn’t really doing anything. Just drawing a random line and watching the ball bounce around until it wiped the last pixel off the screen. No, honestly, I really don't. Overall, I’d say the gameplay needs a bit of work. 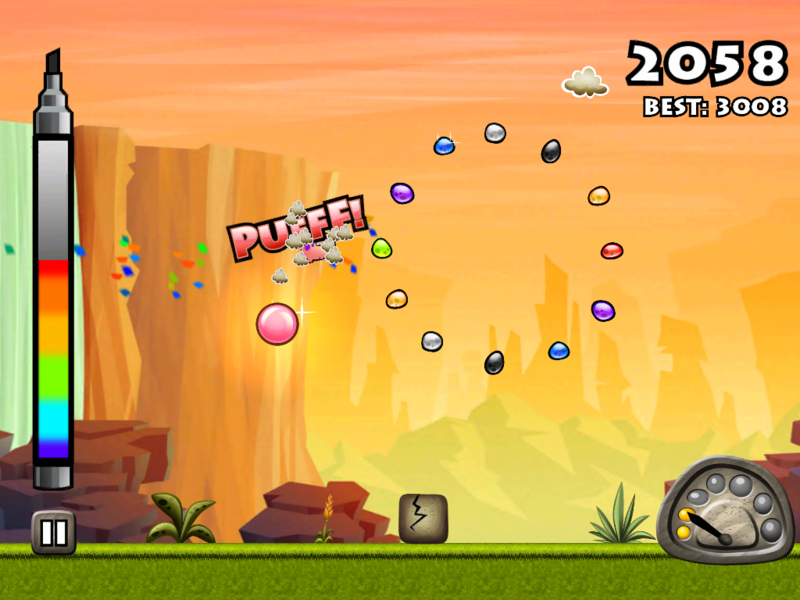 Puzzle mode is rather frustrating and Destroy mode lacks any kind of challenge, which is desperately needed in a game because that is what holds the interest of the player, not just watching a ball bounce around the screen. It looks really nice and just needs some attention to the way the game elements hang together. 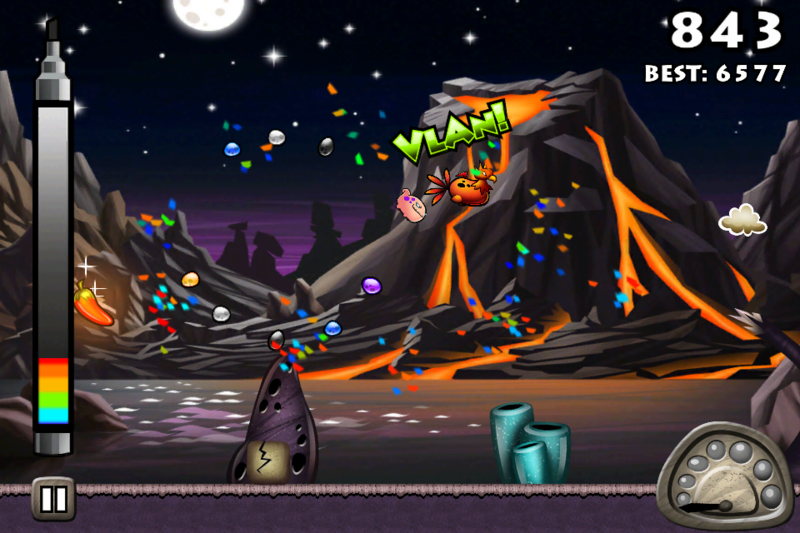 You can find more information about the game at the smuttlewerk website. 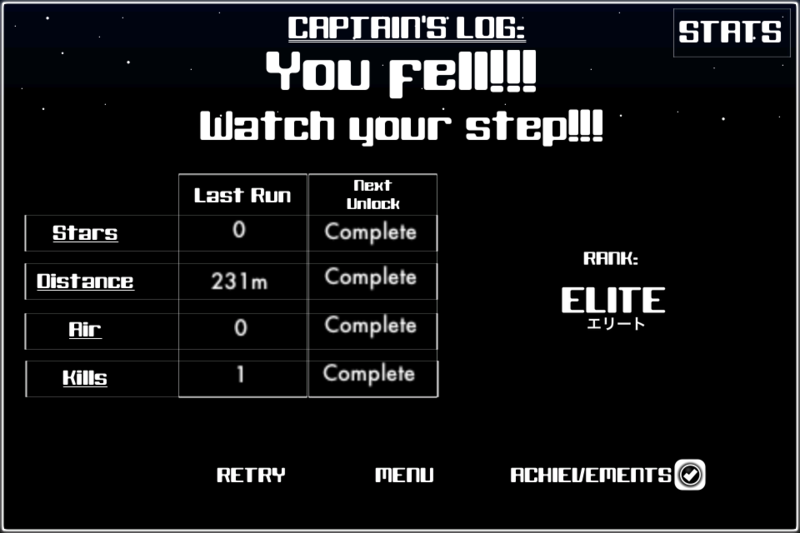 Air Supply – 1bit Run update – version 1.2 now available, plus exclusive preview of 1.3! 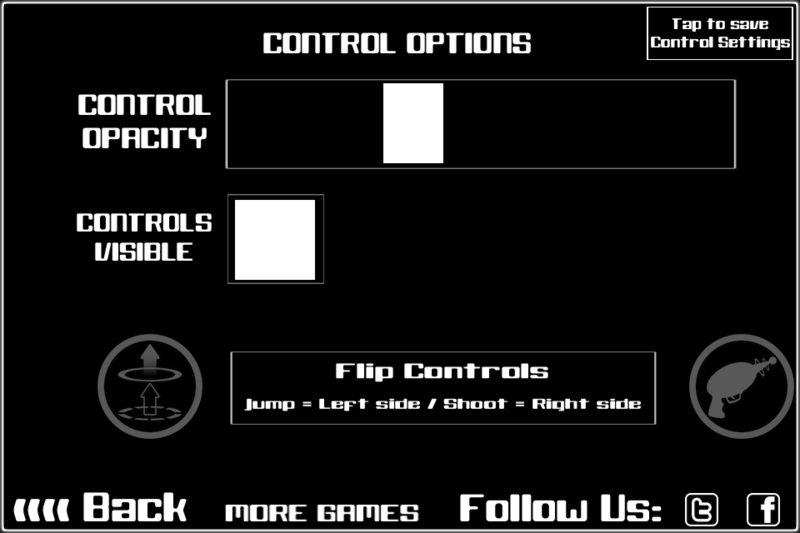 Air Supply – 1bit Run has recently (29th March 2011) been updated to version 1.2. This is really just an interim update before the unveiling of something rather wonderful in version 1.3. More on that spectacular Arcadelife exclusive later. You do understand I have to make the absolute most of these exclusives, don’t you? Hello lovelies! What’s new in this release I hear you ask! 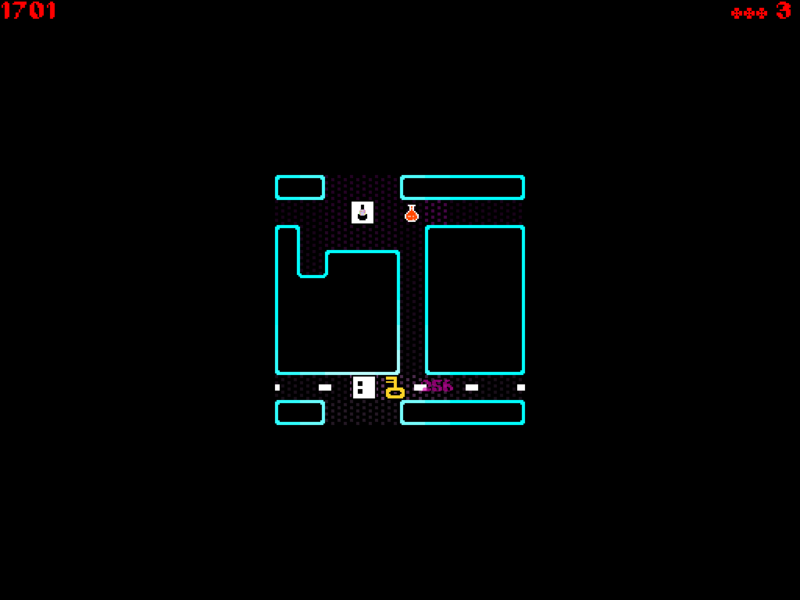 *Added a new short and sweet track by Mister Beep – this gives the game an awesome 1bit soundtrack of 8 chiptunes in total. 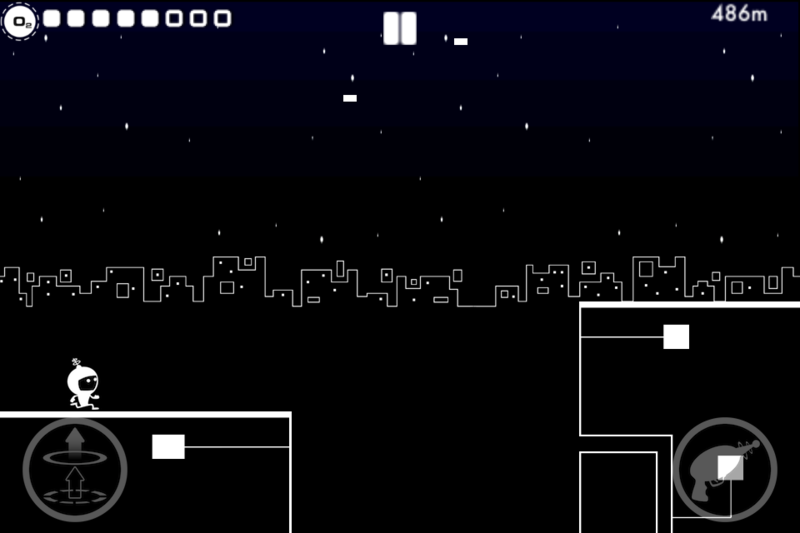 *Added ability to adjust opacity of ‘always visible’ control graphics. *Reduced amount of stats visible at game end. 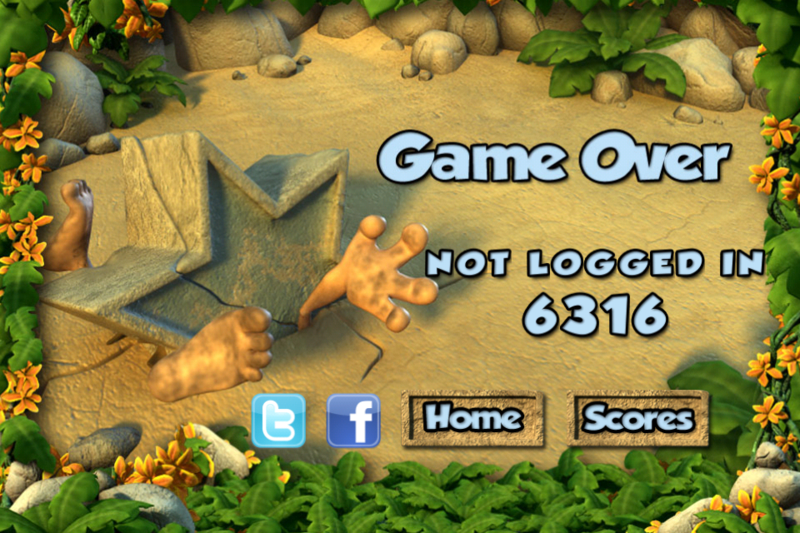 You can still see the full stats by pressing the button in the top right hand corner of the game over screen. 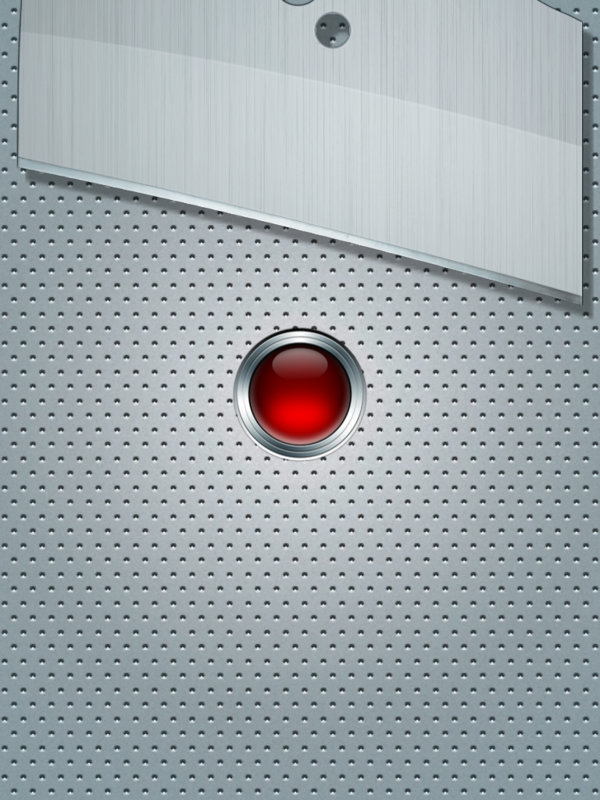 The controls permanently visible, with your choice of opacity. I can't wait to try that out ... ! 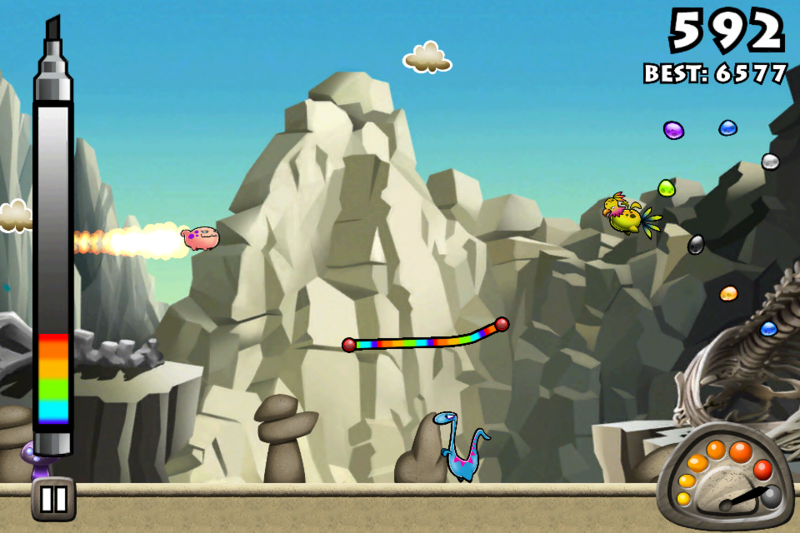 10 word description: Flying/distance game; draw lines; earn coins to unlock upgrades. 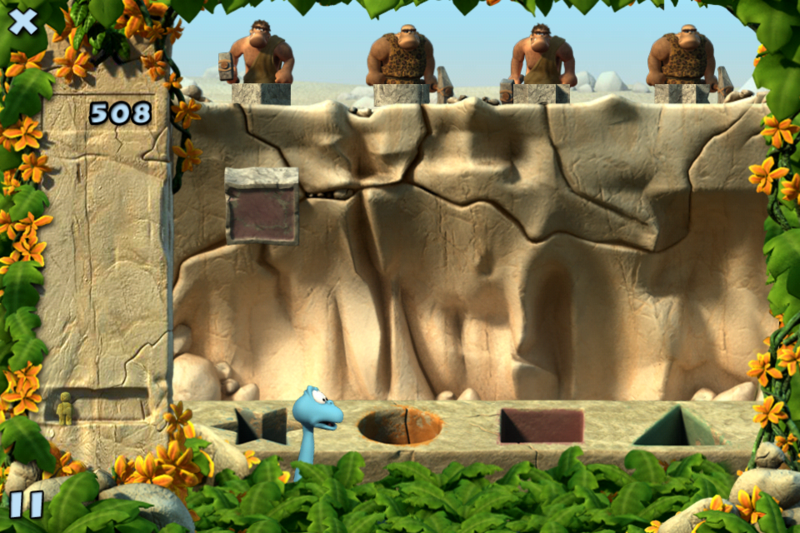 (iPad screen image) That 'Grumpy' dino is one of the unlockable characters. 10 word review: Colourful, casual, instantly playable; great addition to the Chop-Chop collection. (4th gen iPod screen image) You can draw lines of any length and curve, even complete loops. 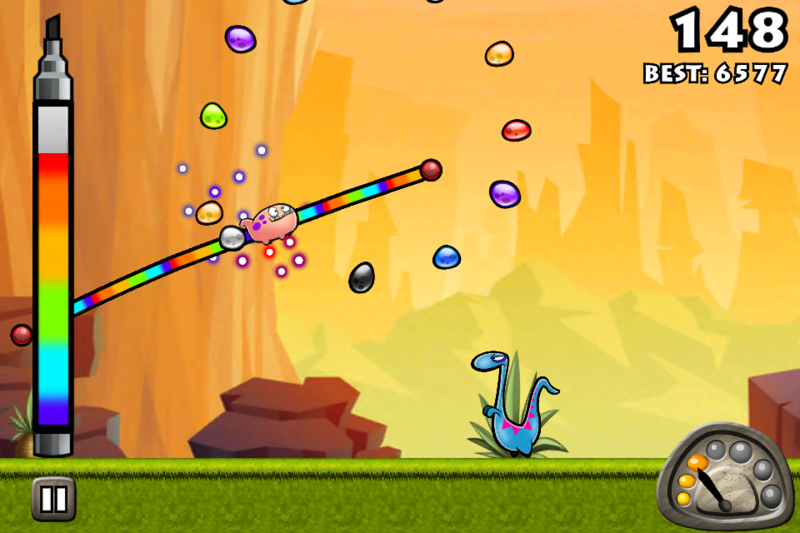 You will like this if you enjoy: Other Chop-Chop games, Solipskier, flying/distance games. (iPad screen image) Who you callin' a puff? The good news: Bright, cheerful, polished, pick-up-and-play fun. Players of Chop Chop Caveman will appreciate the way the graphical style has been incorporated into a different type of game. 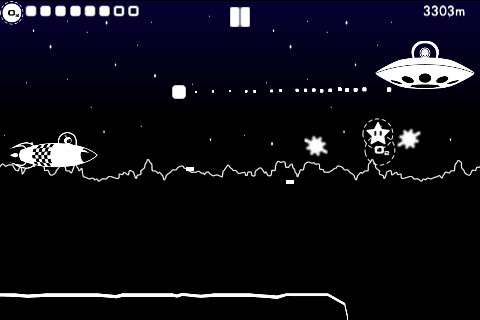 Simple controls, cosmetic and “boost” upgrades, varied and entertaining game world. (4th gen iPod screen image) You can unlock different worlds quite quickly, but the changes are purely cosmetic. The bad news: The completely freestyle line-drawing can lead to the occasional unplanned result, such as your dino reversing direction and flying backwards, which ends your flight rather abruptly. 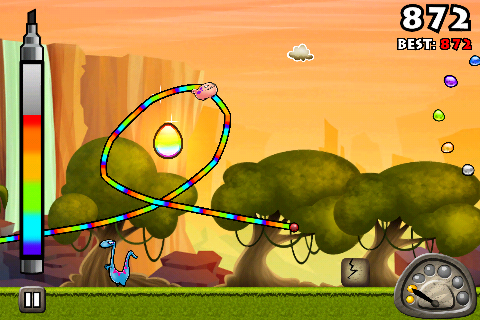 I’ve also seen my dino fall through a drawn line a few times for no obvious reason. Arcadelife verdict: Chop Chop Kicker is another fun game in the series, departing from familiar running/platform mechanics while retaining the casual feel and the fun cartoon style graphics of the earlier games. 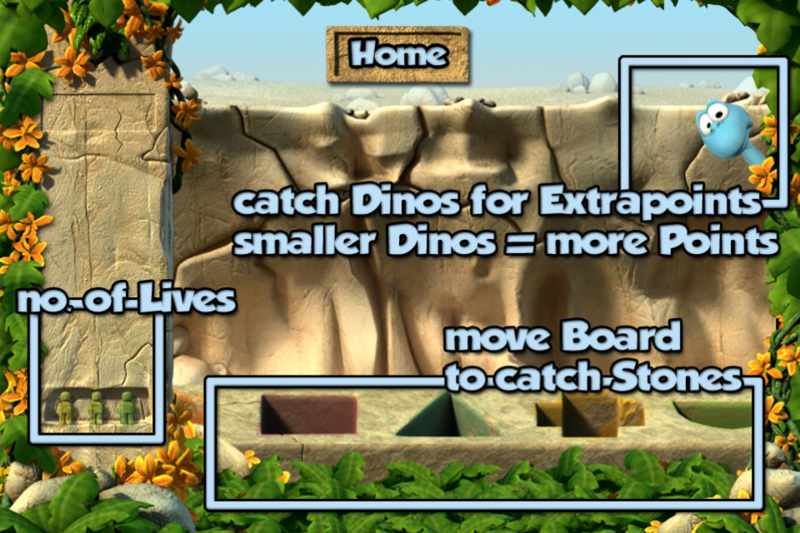 Drawing lines to make ramps and little ski-slopes for your flying dino is very simple and intuitive. When you manage to successfully draw a full loop through a pattern of jelly-beans it is very satisfying. 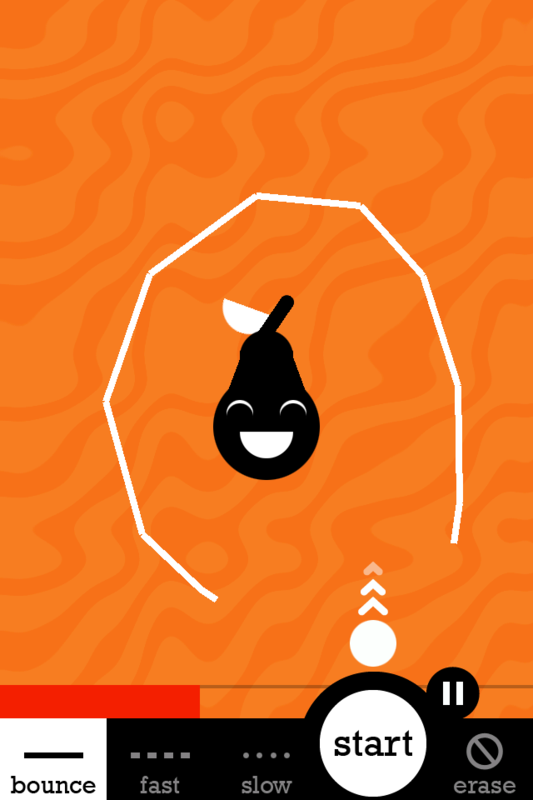 (3rd gen iPod screen image) Looping is much more satisfying when you don't completely MISS THE GIANT EGG! 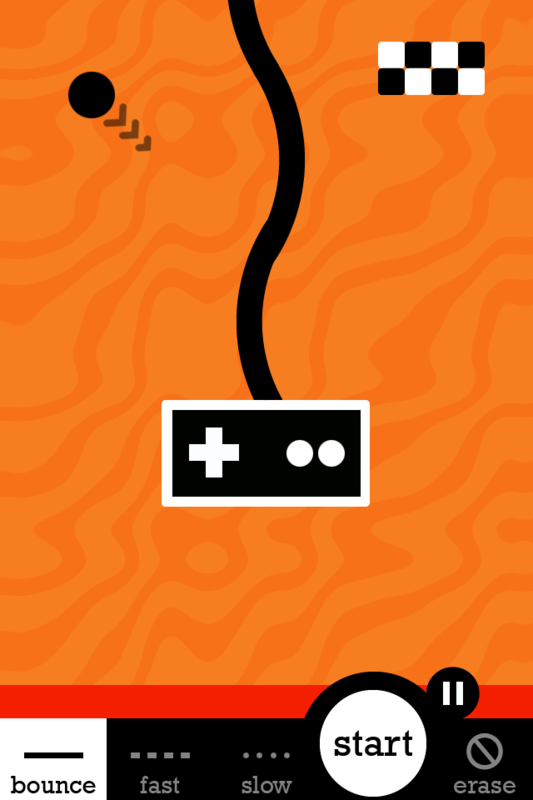 You start off with enough magic ink to make quite a lot of progress, even on your initial fumbling flights; enemies and obstacles add comedy value as much as they add challenge and the game never feels frustrating. 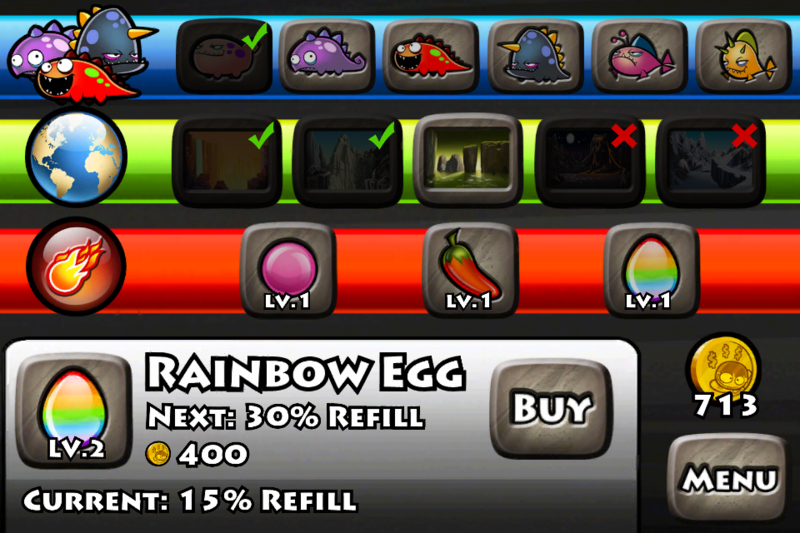 The unlockable items – dinos, worlds and booster upgrades – will all come with time, giving you a steady drip-feed of new content while you play. 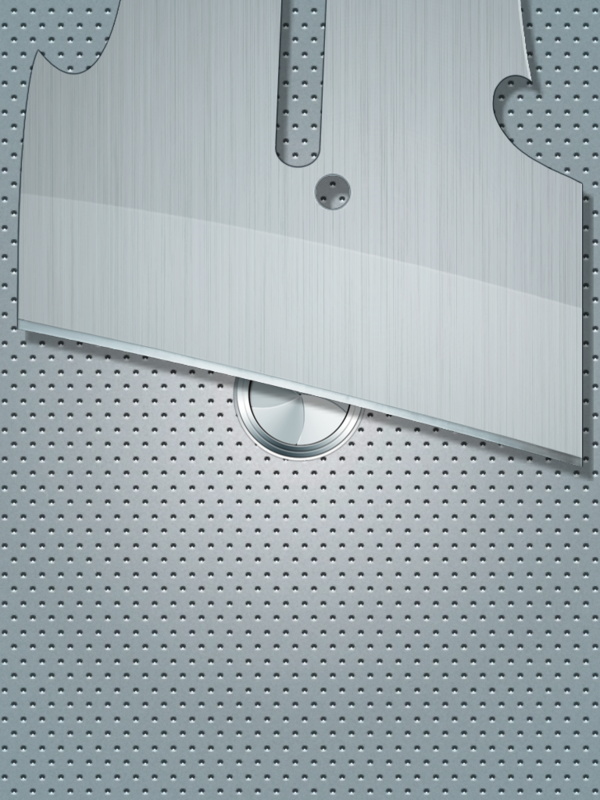 (4th gen iPod screen image) Not all unlocks are purely cosmetic. 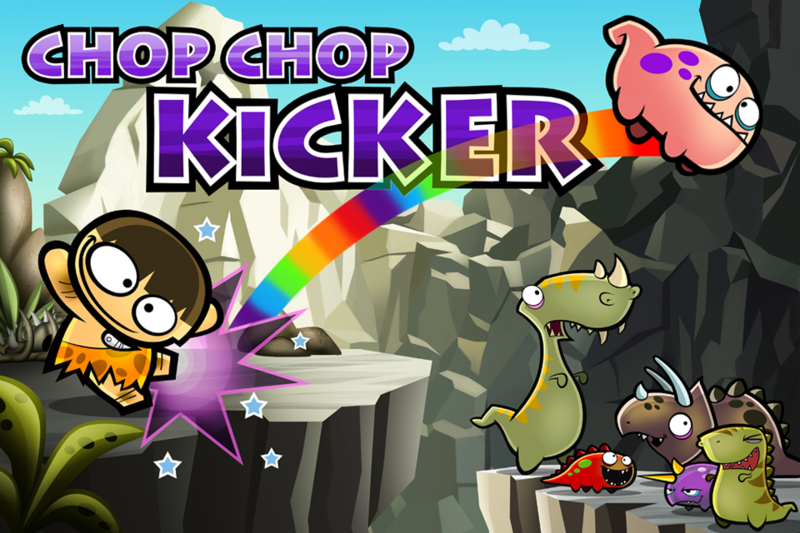 Chop Chop Kicker is universal and looks great on Retina display and iPad. It would definitely benefit from a set of challenge levels to complement the basic ‘endless’ flight mode but is still an enjoyable and replayable pick-up-and-play game. 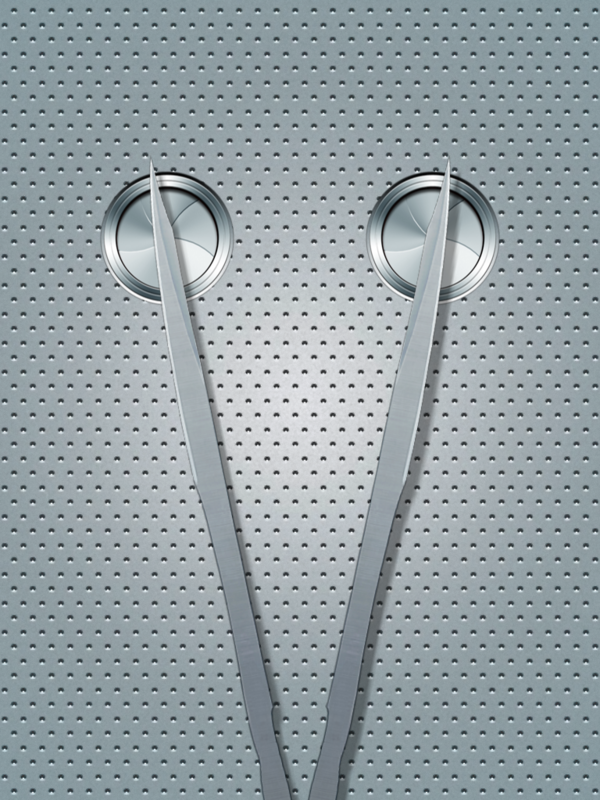 ° … and many more improvements and fixes! 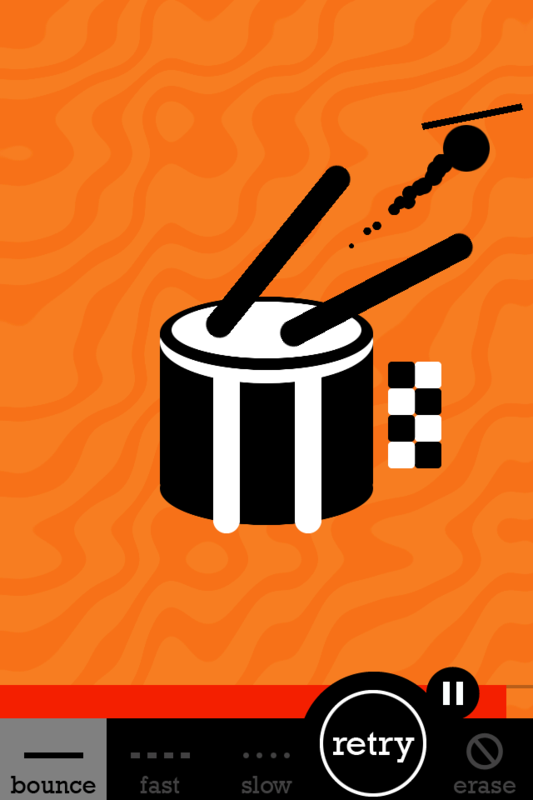 Click on the thumbnails to view the full size (Retina display) images. 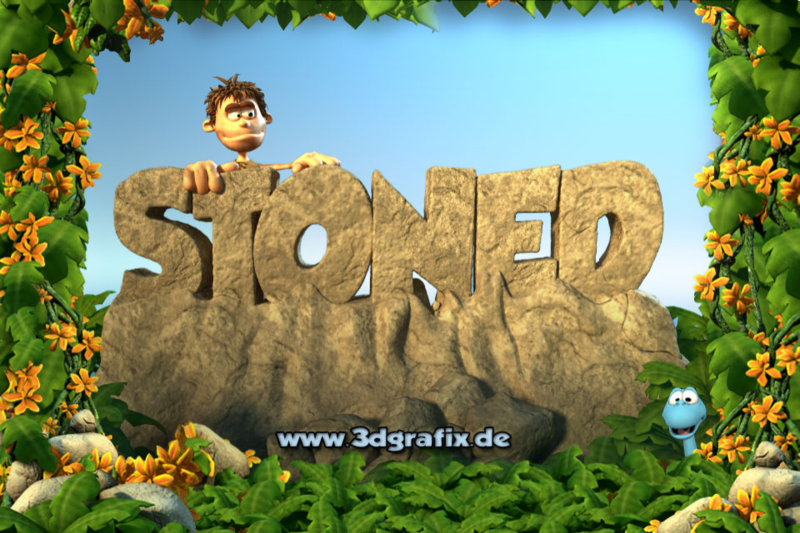 Stoned 3D is good looking, but arguably more of a 2.5D game than full 3D as it is a single-screen 2D game with 3D objects. Putting Shape-matching in the description gives the impression that this is a game for “younger players” but I found it entertaining (and quite tough) and I am really not that young! The latest update has mostly polished the rough edges (gotta love these stone quarry puns) and added or refined the online elements. 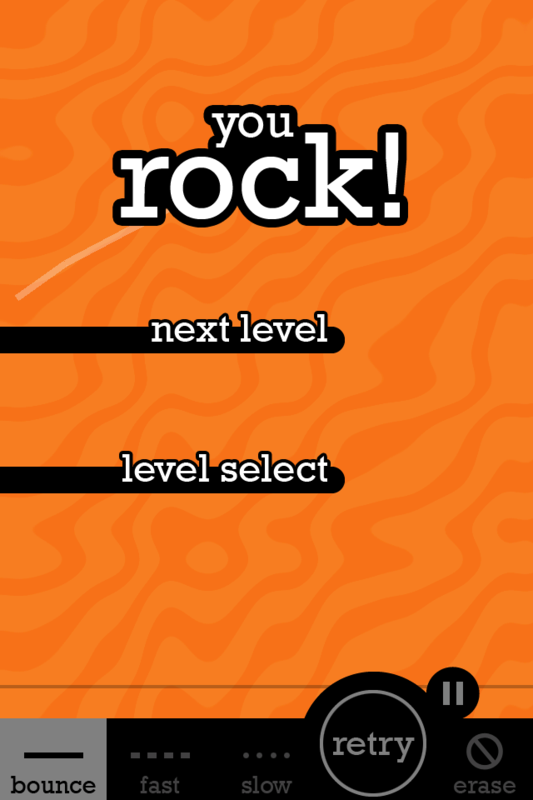 This game is aimed pretty squarely (I know, I can’t stop myself) at the casual gaming crowd with its simple pick-up-and-play concept and single swipe control method, but it’s easy to recommend as it is an instantly playable little game and avoids the more tedious app-store casual-gaming clichés. 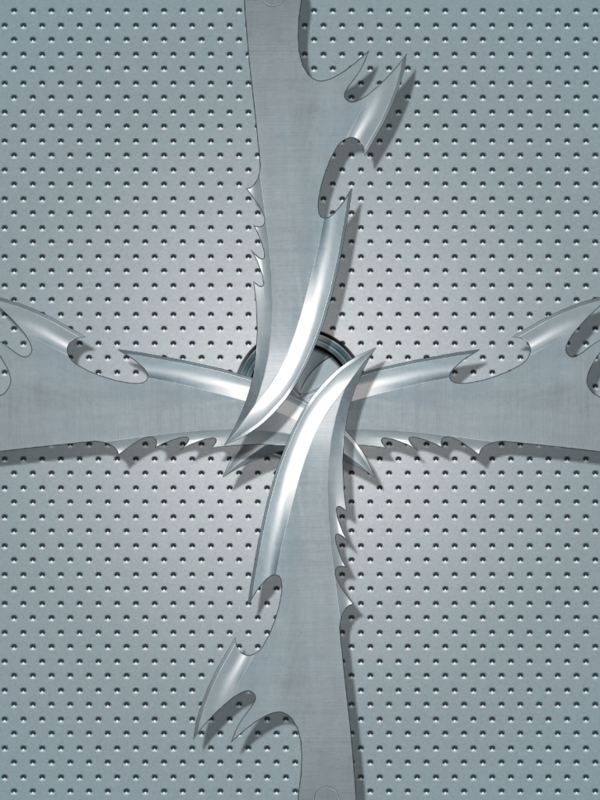 10 word description: Multi-touch, move/avoid blades, push button. Twister meets Saw. "Hello .... I want to play a game..."
10 word review: Unique, very stylish. Clinically clean blades are genuinely intimidating. Intense! Slide blade ... push button ... ah, this is going to be easy! 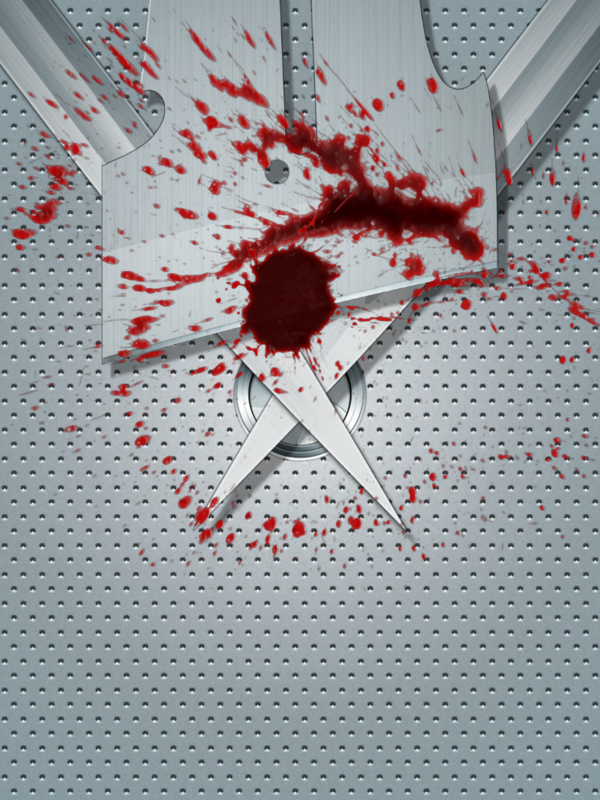 You will like this if you enjoy: Playing with knives; “Saw” traps; clever puzzles; razor sharp graphics. Now that's just ... not fair. The good news: This could be the perfect multi-touch game. Graphics, concept, gameplay and touch controls are all very, very good. "Yes, there will be blood." The bad news: The absence of menu, level select, restart-confirm, and any kind of in-game performance rating (there is an online leaderboard for completing the whole game), plus a relatively small number of levels, mean that there is quite a lot of room for enhancement. Note that the current Arcadelife rating for this game reflects all of that. "Did you cut yourself because you truly wanted to die or did you just want some attention?" Arcadelife verdict: The perfect multi-touch game? It’s definitely a fantastic looking, unique and incredibly intense experience. 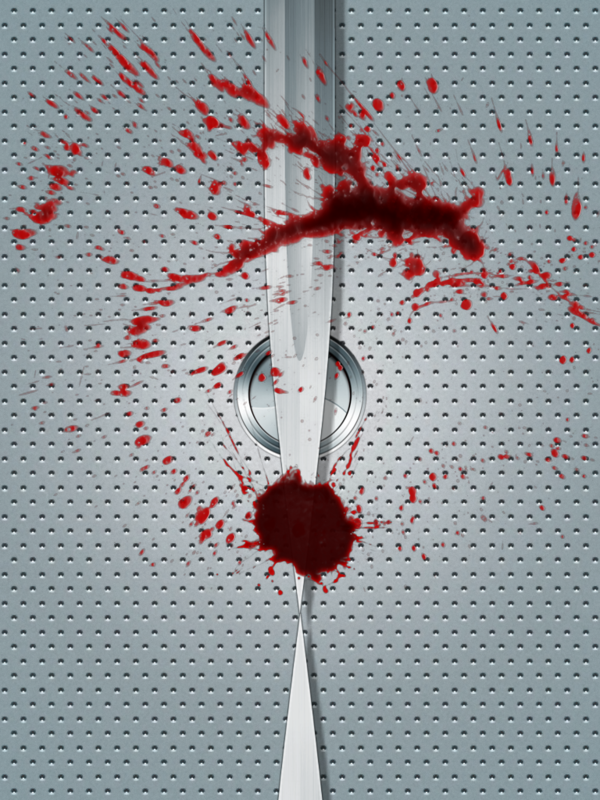 The art style is great; shiny, polished blades against a sparse, clinically clean surface and gory splatters of very realistic looking blood. Although there are only 24 puzzles the difficulty curve is almost perfect, with each puzzle adding more complexity, precise timing and puzzle elements as you progress. Until you get more than half way through the puzzles, failure means you have to repeat the previous puzzle. This adds to the tension and it is a great relief when you reach the point where you aren’t tested in this manner! Currently, the only way to rate your performance is the online leaderboard, where crazy people spend 24 hours every day "testing" themselves. Sound is also used well; sudden jabs of harsh noise accompany the blood splatter whenever you slip up and cut yourself – ouch! 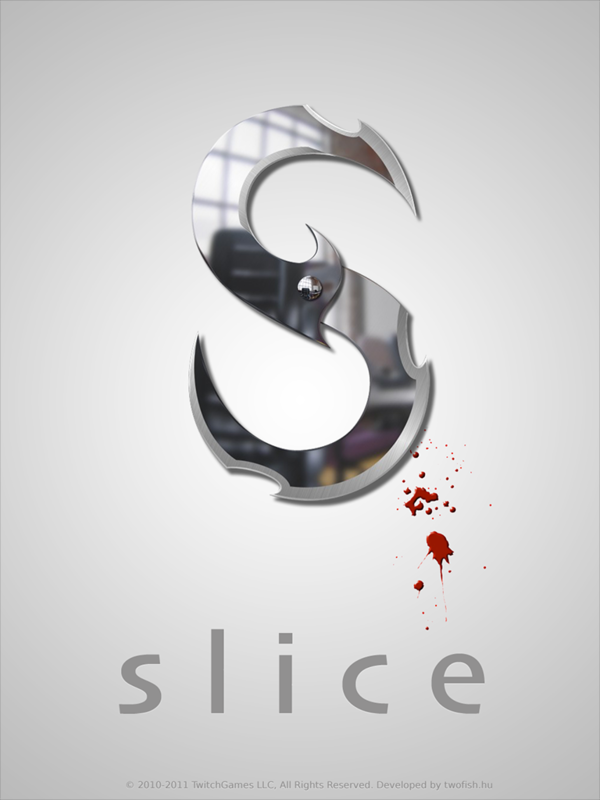 The movie poster for "Slice II" was decidedly minimalist. You are currently browsing the ArcadeLife : Life vs Video Games blog archives for March, 2011.